* More information about these upcoming meetings andevents will be available soon. The Society was planning to exhibit again at the 2018 Tredyffrin Township Community Day – “Party in the Park” on Saturday 16 September 2018 from 4 pm until 7 pm at Wilson Farm Park in Chesterbrook, but the event was canceled due to anticipated bad weather conditions. The Society exhibited again this year at the 2018 Paoli Battlefield Heritage Day on Saturday 22 September 2018 from 11 am until 4 pm at Paoli Memorial Grounds in Malvern. On Saturday 29 September, the Tredyffrin Historic Preservation Trust held their 14th Annual Historic House Tour from 12 until 5 pm. The proceeds support the rebuilding of the historic Jones Log Barn and the proposed Living History Center at Duportail. 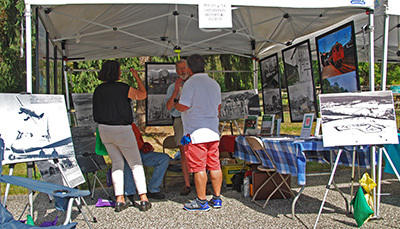 The Society exhibited again at the 2017 Paoli Blues Fest on Saturday 7 October 2017 from 11 am until 6 pm at Paoli Presbyterian Church. We had good weather and lots of people on hand to enjoy the sights and sounds, as well as great food and drink. See more about the Society's involvement here. For various reasons, the Society will not exhibit at the 2018 event. On March 7, 1939 the first annual Banquet was held at the Windmill Tea Room (the General Jackson Inn) at Paoli. 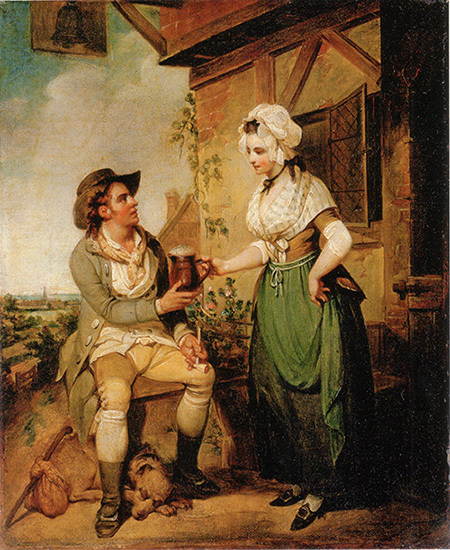 Originally the Club had these affairs at some historic inn. To date the following Inns have played host: The King of Prussia (once), Ye Old Bull Tavern (three times), General Warren (twice), Wayside Inn (General Jackson) (Five times). 21 May 2013 – General Warren Inne. 7 May 2014 – Kimberton Inn. 1 April 2016 – General Warren Inne. A portion of the proceeds from these events benefits the Tredyffrin Easttown Historical Society. 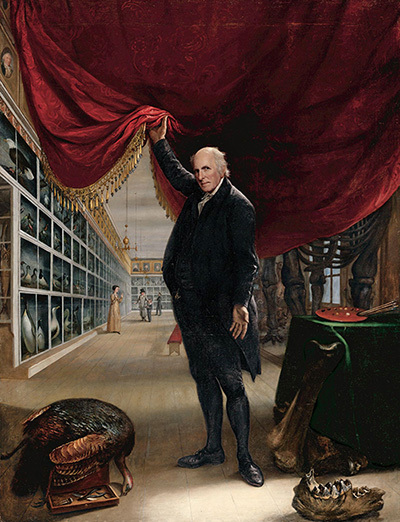 Gale's talk will highlight one of the founders of the Pennsylvania Academy of the Fine Arts, the artist Charles Willson Peale. According to his diary, Captain Peale painted miniatures of General Washington and several other officers and their ladies at the Valley Forge encampment. Peale, who many consider a Renaissance Man, painted portraits of numerous political figures in Philadelphia during the American Revolution. He was also deeply interested in the scientific world and was militarily and politically involved in the creation of America as a nation separate from England. A well-known artist of the day, Peale was involved with political, military, and cultural activities after the War for Independence, too. This presentation will be held at the Easttown Library & Information Center in Berwyn, PA on Sunday 17 March 2019, starting at 2 pm. Gale Rawson retired in 2017 after 36 years at the Pennsylvania Academy of the Fine Arts (PAFA), first as Associate and then Senior Registrar of the Museum. Prior to that, she was the associate registrar of the Yale University Art Gallery and an appraiser with Schiffer Antiques. During her time at PAFA she organized over 300 exhibitions, including Red Grooms, Horace Pippin, American Sublime, Daniel Garber, Cecilia Beaux & Henry Ossawa Tanner. She is currently working exclusively on PAFA's World War I and American Art exhibition, which appeared in 2017 at PAFA and the New York Historical Society, and then at the Frist Center for the Visual Arts in Nashville. On Sunday 24 June, all current Society members were invited to join us for our Annual Member Excursion, which this year took us to the Old Eagle School in Strafford. 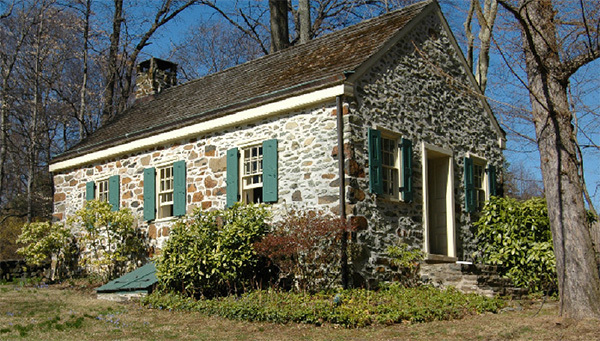 The current historic stone building was constructed in 1788 to replace the original 1768 log structure, served as a school until 1872, and was later used as a Sunday school and chapel. In the adjoining cemetery are some 70 graves, including those of many early settlers of the area, as well as several revolutionary soldiers who died during the Valley Forge encampment of 1777–78. 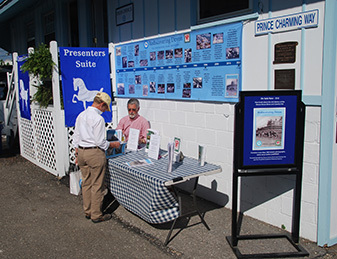 We were joined again this year by members of the King of Prussia and Radnor Historical Societies, and enjoyed an informative presentation on the history of the building and grounds. 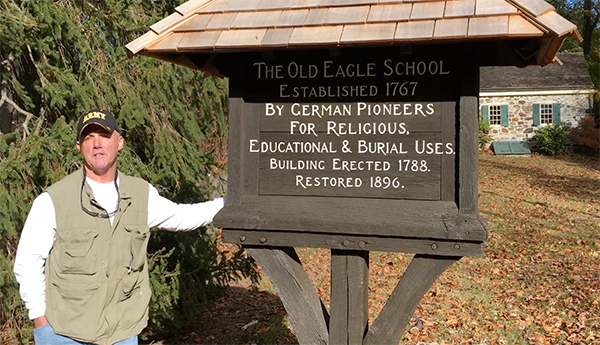 Eugene Hough, Monument Education Preservation Field Specialist with the Heritage Guild Works Legacy Marker Program, conducted an impressive flag folding ceremony and provided a detailed overview of his phase 1 preservation work on the historic Old Eagle School Cemetery Grounds. Afterwards, we gathered for conversation and refreshments, including delicious tea sandwiches and seasonal beverages. We are grateful to Gene and the Old Eagle School Board of Trustees and volunteers for their support of this event. The school is located on Private Way in Strafford, just off Old Eagle School Road, north of the Strafford train station. There is limited parking at the school itself. Private Way also serves as a street for several private homes so please do not block the road with your vehicle. Additional parking can be found one block south at the Goddard School, on weekends. 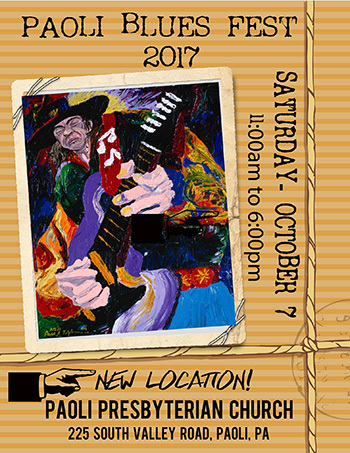 On Saturday, 7 October 2017, the Society participated as an exhibitor for the seventh consecutive year in the nine-year history of the Paoli Blues Fest. We were pleased to have nice late-summer weather and a good turnout, this year in the new location at Paoli Presbyterian Church. 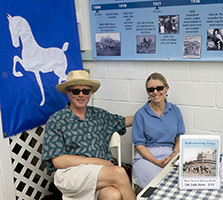 The ten-by-ten foot exhibit tent was located at booth position #54 near the northwest corner of the parking lot exhibit area. 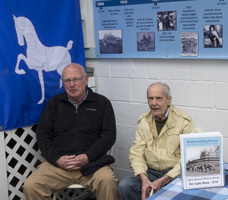 The steady stream of visitors who visited the tent throughout the day were fascinated by the diverse collection of historic photographs on display, and enjoyed having the opportunity to both learn about, as well as share their knowledge of, local history. This year we displayed a new set of large, poster-size images of the Main Line Airport for the enjoyment of our vistors. Exhibiting at this community event is a wonderful way to introduce the Society to a new and wider audience, as well as to connect with many friends who stop by to chat. If you are interested in the enjoyable work of helping to staff the booth, please contact the Society by email or speak to one of us at a Society meeting. Information about our Blues Fest participation in previous years can be found here: 2011, 2012, 2013, 2014, 2015, and 2016. 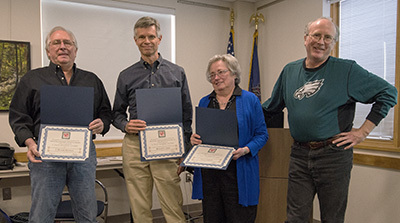 A selection of pre-recorded programs featuring presentations from past meetings of the Society are available for viewing on Tredyffrin Township Television, found on Comcast Channel 15, Verizon Channel 24 and On-Demand. We are looking for volunteers who would be willing to assist with the recording of our presentations for later broadcast. Free training is available to township residents at the Greenwood Studio facility in the Township Building. Please contact us or Studio Manager Gene Donahue if you are interested. Did you know? 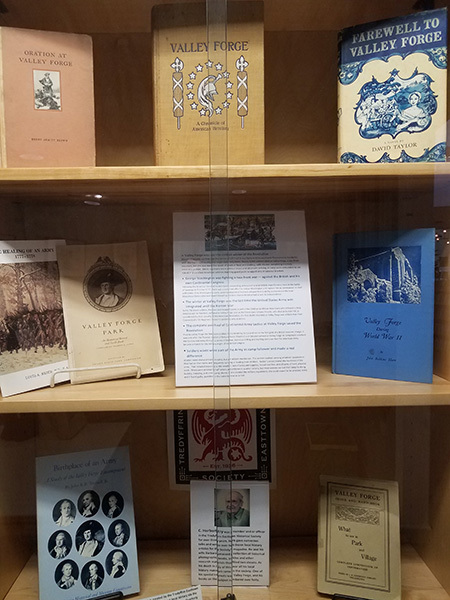 The TEHS maintains a display case of local history materials in the Local History Room at the Tredyffrin Public Library. The current exhibit highlights Herb Fry's book collection. 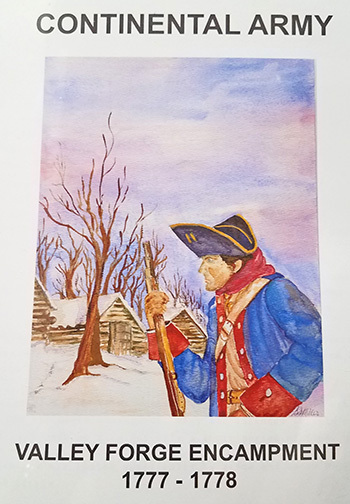 C. Herbert Fry was an active contributing member and officer of the Tredyffrin Easttown Historical Society for over thirty years. 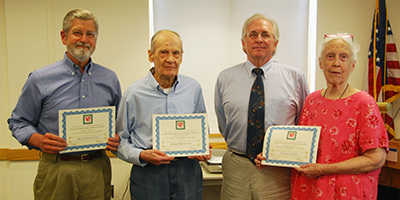 Herb gave numerous talks and wrote over two dozen local history articles for the Society's History Quarterly periodical. He and his late wife Barbara amassed a collection of historical photographs, books, articles and other research materials that filled two closets. Following his death in July 2018, all of his local history materials came to the Society. One of his special interests was Valley Forge, and his books on the subject numbered over forty. Eight of these are displayed in this case. Another example is this book by Frank Resavy & Tom McNichol. 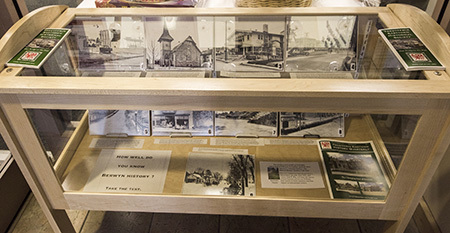 During the month of April 2018, a display case in the main entry hall of the Easttown Library & Information Center in Berwyn contained an exhibit featuring nine historic photos of Berwyn with intriguing captions, testing the viewer's knowledge of the area. On Friday 2 June 2017, as part of their ongoing SummerFest series, local television network affiliate CBS 3 (KYW) spent much of the day at the Devon Horse Show & Country Fair, with a video crew and several on-screen personalities, exploring various aspects of the event. A combination of pre-recorded and live segments appeared during the Eyewitness News broadcasts at 5, 6, and 11 pm. Earlier in the week, Society president John O. Senior, and former president Michael Morrsion were interviewed by producer Aubrey Clerkin about the historical background of Devon. The Society provided several historic photos that were included in the program, along with short segments from the interviews. The first portion of the program, focusing more on history and including this content, was originally shown on Friday just after 5 pm, and is provided below. The complete story, as it appears on the CBS 3 website may be viewed here. 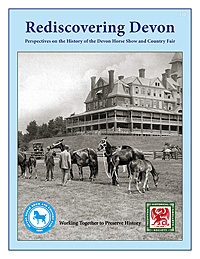 From 22 May – 1 June 2014, Society members staffed a table located at northwest corner of the Committee Stand, very close to the main entrance, where our publication "Rediscovering Devon" (prepared in collaboration with DHSCF) was on sale. Many people stopped by and visited, and many others passed by and admired the large timeline banner immediately above our display table. On Friday 12 September 2014, we once again set up our display table in the same location during the Devon Fall Classic. John & Nancy, Dixon, Jim & Herb on "booth duty"
On 15 June 2014, the Society held our 2014 Member Excursion at DHSCF. As we passed the milestone of our 75th anniversary as an organization in 2012, it seemed fitting to establish a new annual award to recognize the especially significant contributions made by some of our members over the years. 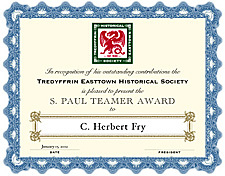 In considering what name this award should have we decided to reach back to the very beginning of what was then The Tredyffrin Easttown History Club and to founder and first president S. Paul Teamer. It is certainly worthwhile to look back at those first few volumes of the Quarterly and rediscover the noteworthy articles written by Teamer and his colleague Franklin L. Burns, among others, who set a high standard for those who followed. 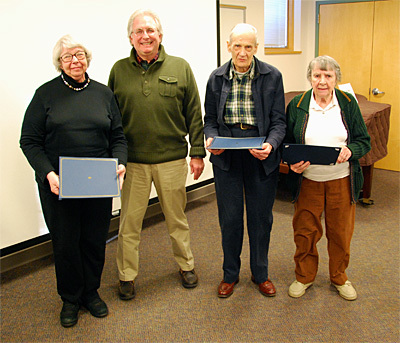 At the January 2012 Annual Meeting, we were pleased to present the S. Paul Teamer Award for outstanding contributions to the Society to the first three recipients: Sue Andrews, Herb Fry, and Joyce Post. 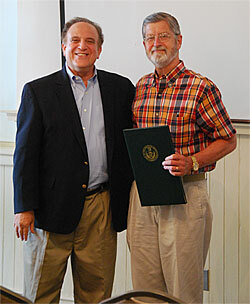 At the January 2013 Annual Meeting, we were pleased to announce the names of the next two recipients of the award: Bob Goshorn (posthumous) and Mike Bertram. Since Mike was unable to attend this meeting, his award will be presented at a future meeting. At the January 2014 Annual Meeting, we were pleased to announce the names of the 2014 recipients of the award: Franklin L. Burns (posthumous) and former president Roger D. Thorne. At the May 2015 Meeting (rescheduled from the January 2015 Annual Meeting cancelled due to adverse weather conditions), we were pleased to recognize the 2015 recipients of the award: Barbara Fry (posthumous), Mary Robertson Ives (emeritus), and Clarissa F. Dillon. 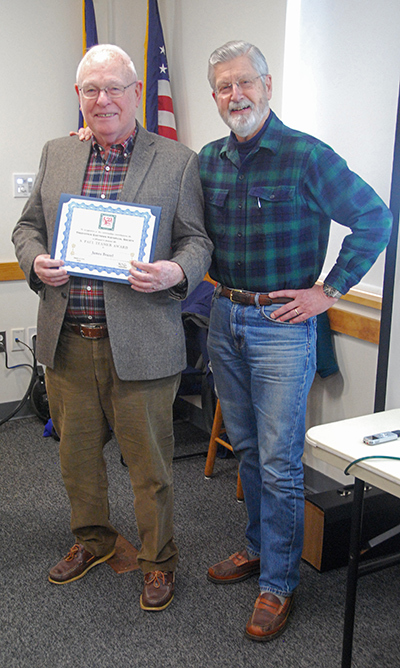 At the January 2016 Annual Meeting, we were pleased to present the award to: John O. Senior. For several reasons, the award was not presented in 2017, but at the January 2018 Annual Meeting, Michael Morrison, Tim Lander, and Cheryl Leibold were recognized as new recipients. At the January 2019 Annual Meeting, Heidi Sproat (unable to attend) and Jim Brazel were recognized as new recipients. 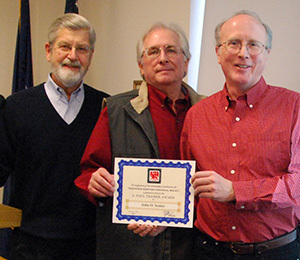 At the January 2012 Annual Meeting, the Society elected Michael Morrison as its new president. Michael took over from Roger Thorne who served as president for nine years, leading the Society through a period of remarkable change and growth, including the transition to a 501(c)(3) organization. Roger will remain active as Board of Directors Chair with our thanks and appreciation for his vision and dedication. Michael is a published historian who led the Archives Committee for several years, and his passion for history and great enthusiasm for the Society has helped us to continue to grow and develop. In April 2016, Michael stepped down and Vice President John O. Senior took on the duties of President. 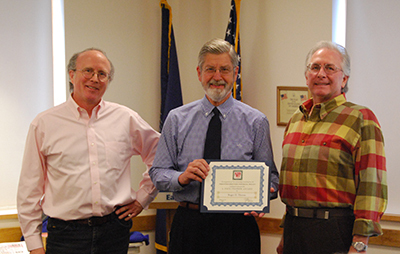 Michael remained very involved and continued to serve on the Board of Directors through 2018. John initially became involved by creating the Society's website in 2006. His role gradually expanded as he managed the digital conversion of the History Quarterly back issues, serving on the board since its inception in 2008, and as Vice-President starting in 2010, and he has been editor-in-chief of the History Quarterly since 2013. 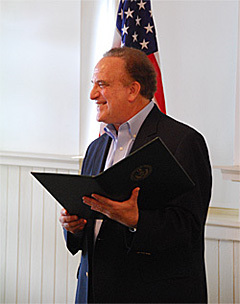 At our June 2011 special meeting at Historic Waynesborough, we were pleased to once again welcome State Senator Andy Dinniman, this time to present the Society with a special state proclamation recognizing seventy-five years of exceptional community service. 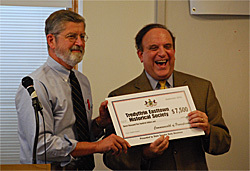 Roger Thorne also expressed our appreciation for the support that Sen. Dinniman provided in helping us to obtain the recently concluded 2009 DCNR grant that funded several important projects, including the acquisition of new aerial photos of the region, other selected historical photographs, and a noteworthy collection of recorded and transcribed oral histories. 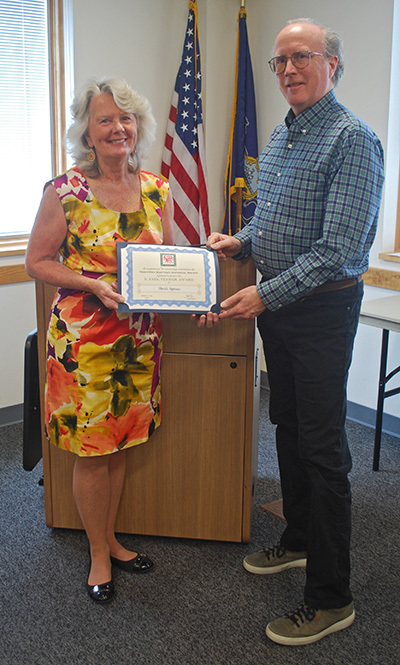 At the September 2009 meeting, we were pleased to welcome State Senator Andy Dinniman and former State Representative Carole Rubley to recognize them for their valuable assistance in helping the Society to receive two DCED grants that have supported our Digitization Project. 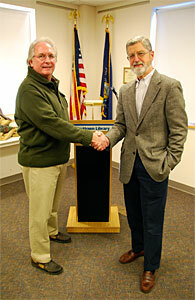 Senator Dinniman presented us with a check for a new DCNR grant to support several important projects. The 2006 Mildred Kirkner Memorial Essay Contest.